It’s hard to ignore the ease of an instant microwaved meal. 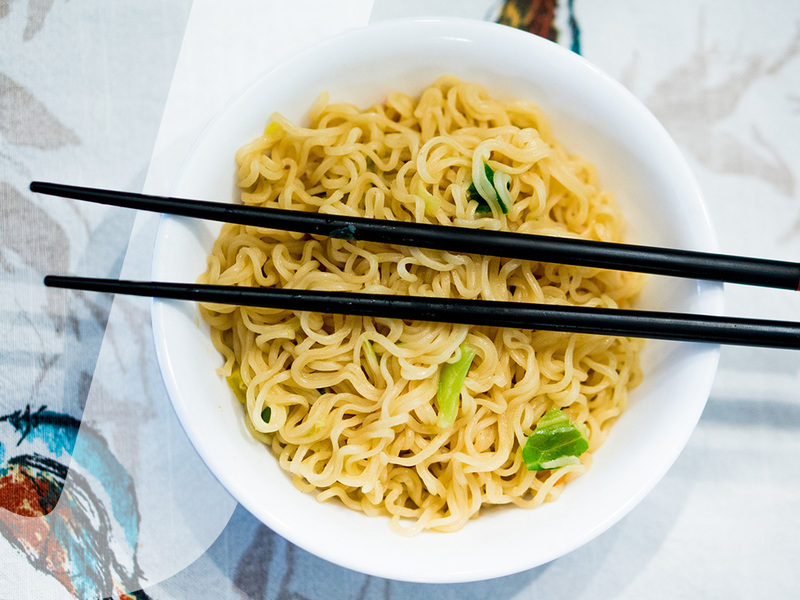 From instant ramen to frozen pizzas, the convenience of a ready-made meal can often trump our need for health. Not only that, but microwaveable meals so often lack the fiber and protein needed to keep you full throughout the day – resulting in unhealthy snacking shortly afterward. This popular food option is probably the hallmark of sad lunches everywhere. Though high in sodium and low in nutrition, its easily-accessible price point is hard to beat. That being said, instant ramen is super easy to doctor up! Add a raw egg to the bowl before microwaving. Poke small holes in the yolk to prevent unexpected explosions and microwave according to the directions. Have some frozen or fresh veggies on hand to add to the bowl before microwaving. Not enough room to add your vegetables? Transfer your ramen into a microwave-safe bowl that allows more room on top to add all of your favorite goodies. Some of our favorite vegetables to add are corn, green beans, mushrooms, baby bok choy, and spinach. This food option runs in a similar vein to the instant ramen in that they are both cheap and non-perishable food options. For many, instant mac & cheese invokes a certain nostalgia and comfort that you sometimes need during a lunch break, but it can definitely be improved upon. Try substituting some of the powdered cheese with some shredded or cottage cheese. This will not only reduce the amount of sodium you’re consuming but will add some much-needed protein. You know what else goes great with cheese? Broccoli. And cauliflower. Add some florets into the bowl before you microwave and they’ll get cooked perfectly along with your mac & cheese. Find a whole grain version of your favorite mac & cheese to get some extra fiber in your day. There’s very little in the world that can’t be fixed with a nice, delicious slice of pizza. That being said, the frozen variety is usually laden with unhealthy ingredients and preservatives. Also, the serving sizes are sometimes so small that it’s not unusual that to eat more than you should at a single sitting. Since pizza is so customizable, it’s easy to make this a healthier option. The obvious choice is the make your own pizza. Buy some whole grain naan, pita, or tortillas to use as a crust and then get creative with your choice of toppings. If you’re choosing what to put on your pizza, you’ll be more aware of what you’re putting in your body. If you’d rather buy a pre-made frozen pizza, try and opt for a cheese or veggie pizza and then bring your own fresh toppings to add to it. While a quesadilla may not be the most popular option for lunch, it’s ease and customizability shouldn’t be overlooked. If you have a couple of tortillas and some cheese, you’ve already got a great base for a delicious lunch! Add beans and more beans. The health benefits of beans can’t be overstated. Canned beans are great for this because they’re already cooked and there are so many varieties, but you can use whatever you have. Add a nice layer of beans on top of the cheese, microwave for a minute, and you have a great meal. Add your favorite veggies. Do we sound like a broken record yet? Look in your frozen vegetable aisle at your local grocery store and they often have mixed vegetables that are ripe for microwaving! Add a side of salsa to add some flavor and fiber. Don’t let the title scare you – the burrito bowl can be one of the easiest meals to make in the microwave with just a tiny bit of prep. This is also a great option for those that are limiting their carb intake! The options for your burrito bowl are endless, but all you really need to start is a base, vegetables, and a protein. Customize your base according to your needs. This can be microwaveable brown rice, cauliflower rice, or a bed of greens. If you opt for a bed of greens, keep that out of the microwave. You can easily find “tex-mex” mix of frozen vegetables that are ready-made at your grocery store or even use canned vegetables. Try to avoid pre-made mixes that already have seasonings and sauces added. It’s better to add your own seasonings to control how much sodium you consume. Tofu, cooked chicken, beans, and eggs are all great additions to a burrito bowl. If you’re adding a raw egg, remember to pop the yolk and cover your bowl in the microwave to prevent any messy explosions.